Welcome to the future! 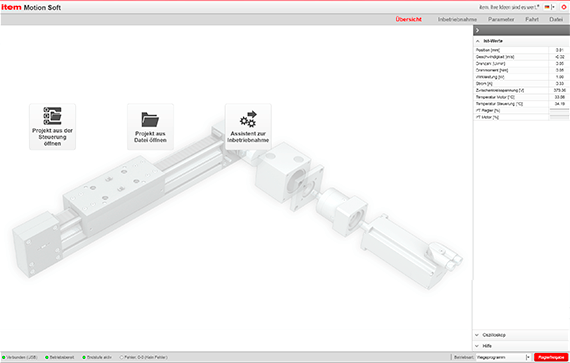 The new item linear motion units® are revolutionising the way that automation solutions are planned, built and commissioned. A customised turnkey system comprising Linear Unit, Motor and Controller will help you boost your productivity fast. Everything runs smoothly with us: item linear motion units® are comprehensive turnkey automation systems that significantly reduce your outlay. Nothing is missing! With just a few details, item MotionDesigner® can pull together the perfect configuration of components. You can also make the most of advice, support and services provided first-hand by item. Simply unpack, install and use! Your custom item linear motion unit® is supplied preassembled and ready-to-install. What’s more, item MotionSoft® directly accesses the data you entered earlier in item MotionDesigner®. Cut out countless steps that would normally be unavoidable. Intelligent software helps you with expert knowledge and you end up with a preassembled turnkey system that you can start using straight away. 26 systems with various drive and guide technologies, optimised for speed, payload, precision and stroke length. Highly dynamic synchronous servomotors for short cycle times and dependable precision, includingmaintenance-free Gearboxes and optimised Drive Sets. Motion profiles can be implemented directly in the Controller, meaning a PLC is often unnecessary, but can be connected if required. For all conventional fieldbus systems. Enjoy maximum safety and rapid installation, thanks to tamper-proof connectors and colour coding. 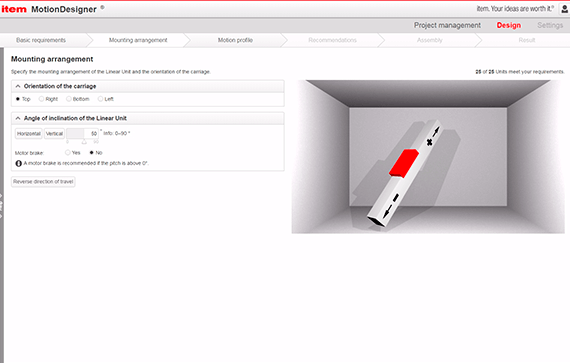 It has never been so easy to find the perfect automation solution: Intelligent software support for choosing, designing and configuring the ideal system. item MotionDesigner® is completely free to use and analyses thousands of options to calculate the perfect combination of components for your specific task. You end up with the right selection of products and a list of useful accessories. This intelligent software covers the entire transport task and factors in your dynamic requirements and technical parameters (operating load, stroke, speed). Simply unpack, install and use! These integrated functions ensure the preassembled turnkey systems can be up and running in next to no time. Do you want to know more about the basics of linear drives, electric motors and gearboxes? We’ve summed up what you need to know about the fundamental technologies in two White Papers. 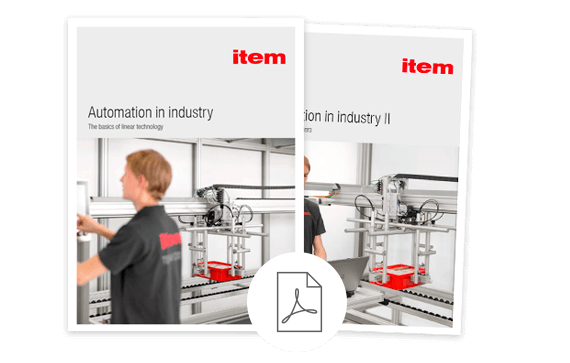 The White Paper “Automation in industry I” focuses on mechanics, while the White Paper “Automation in industry II” deals with the electrical components and drive train.